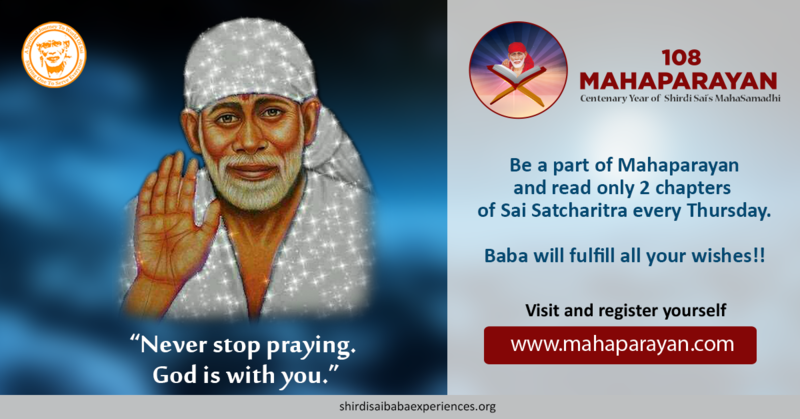 Shirdi Sai Baba devotee Susama from India says: Om Sai Ram, to all readers of this blog. Thank You Sai, as You have chosen me as a member of Mahaparayan group Roll no.9. After joining so many miracle have happened in my life. Today I will share how he saved me from the financial problem. I am a working woman but payment was not sufficient for me. One day I did not have sufficient money to go home and to come to hostel, my working place. I had to reach my home in evening time. I had to hire an auto but amount was not sufficient . Then I surrendered to Sai. At night hour auto fair is higher to reach home that is Rs 80. But I was not willing to spend it and wanted to spend auto fair upto Rs 50 and when I sat in the auto he said Rs 80/. However after few seconds he called another auto and said please drop her and take Rs 50 only. It was a big miracle for me. How he got to know about my financial condition? Had Sai not been with me? Sai please stay in my heart and make me too kind hearted as I am selfish. After blessing I forget all mercy of Yours. Love You. Just as we trust the driver of our car or a pilot of the plane, similarly we need to trust our Sai WHo is the Helmsman of our boat (life). He will surely and safely carry us across this worldly ocean. Love You Deva. Jai Jai Ho Sai.